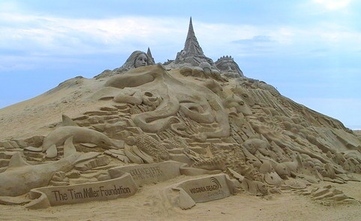 A sandcastle at the Neptune Festival, one of our favorite Virginia Beach fall events. Fall events in Virginia are especially enjoyable, thanks to cooler temps, fewer crowds, and beautiful fall foliage which can range from vibrant reds to glowing oranges and golden yellows. I've put together a list of some of the top area events you won't want to miss, plus contact information you'll need to take advantage of these festivities. And look below for a link to Fall things to do like Halloween events and our favorite pumpkin patches! This annual Virginia Beach event is a great combination of free and paid musical acts, including local musicians and pop acts from yesteryear. Performances are free, except for the headliner acts on the 5th Street Main Stage, the 17th Street park, the 24th Street stage, and the 31st Street Park. You'll need tickets for these, and they run from $15-$25 in advance, and $20-$30 on the day of the show (the Sunday acts are the most expensive ones). Kids 12 and under are free with a paying adult. Buy a Passport Pin for $35 and get admission to all three shows. For more details, go to www.beachstreetus.com. Three-days of fall events celebrating all things Italian, including pizza, pasta, Italian wine and beer, grape stomping, entertainment, and family-friendly activities (like grape stomping!). Go to www.beachstreetusa.com or call (800) 822-3224 for details. See jets--including the US Navy Blue Angels, FA-18c Hornets, Hawkeyes, and more--perform thrilling acrobatic air stunts, plus get a look around this amazing air station. And yes, it's free! Go to http://www.oceanaairshow.com/schedule for the schedule. This is the grand-daddy of Virginia Beach events at the boardwalk, with bands, crafts, food, entertainment and more...but the highlight is the famous sand castle building competition. In fact, Virginia Beach and Myrtle Beach, SC continue to fiercely duke it out in nabbing this top world record. The best thing about this festival? It's mostly free! For details, click here. Come fall, experience spine-tingling chills at the park's annual Howl-O-Scream event, themed dining halls and spirit bars, including "Blood Banquet," "Demon Drinks," "Buccaneer Galley," "Fright Feast,"and "Pirate Baarrgh." 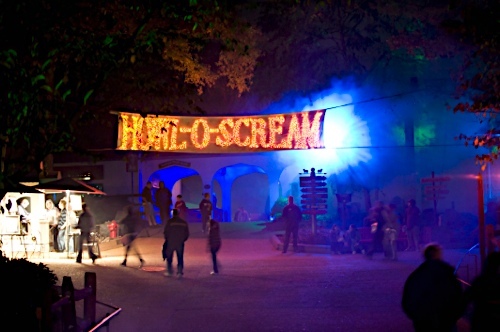 Howl-O-Scream © 2015 Busch Entertainment Corporation. Reproduced by permission of Busch Gardens Europe. All rights reserved. 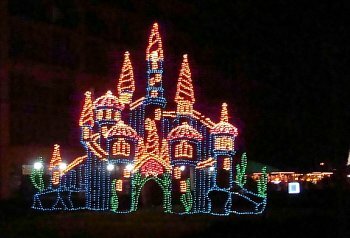 Don't miss a holiday light show!. Ever wanted to cruise the Virginia Beach oceanfront boardwalk in your car? Now's your chance! Plus, you'll be dazzled by jumping fish, surfing Santas, and playful mermaids...all in lights! It's a do-not-miss tradition among Virginia Beach events. Click here for details. Norfolk Botanical Garden "Garden of Lights"
Our family had a great time visiting this winter wonderland of lights last year! Located next to Norfolk International Airport, it's a much quieter and less crowded alternative to the Holiday Parade of Lights on the Virginia Beach Boardwalk. And it's one of the cheaper fall events, at just $10 per car. Not sure what to do this fall? My Fall Fun page is full of itineraries for fall-themed fun, like corn mazes, pumpkin patches, and best places to see fall foliage, as well as National Park fee-free days.